8 Months supply: Gentle Solutions Collagen AM formula, Gentle Solutions Collagen PM formula and Gentle Solutions Sublingual Vitamin B12. 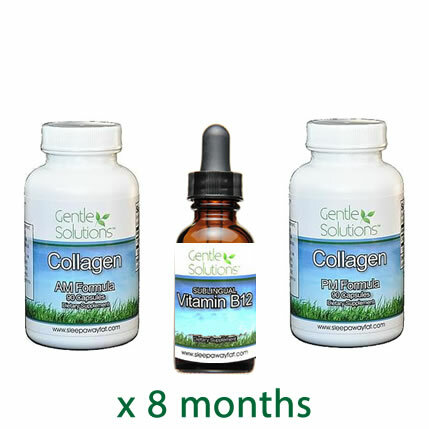 8 Month supply: Gentle Solutions Collagen Am, Gentle Solutions Collagen Pm and Gentle Solutions Liquid Sublingual Vitamin B12 supplements. Taking collagen protein both morning and night aids the body in building lean muscle mass faster than simply taking it once a day. This package was designed to help promote increased weight loss and increased energy with the addition of Liquid sublingual Vitamin B12 complex.